Once again the ‘Wenger Out’ campaign is in full flow. Some Arsenal supporters have become disillusioned with life under Arsene Wenger after another title challenge seemingly fell apart. Others believe Wenger deserves more respect for all he has achieved with the club. It is worrying for the Frenchman that the same flaws have appeared yet again. Arsenal have gained a reputation as ‘bottlers’, and some fans believe Wenger is to blame. Arsenal’s mentality is regularly called into question. Does the squad have the right frame of mind to be winners? In the past, fans have called for the Arsenal board to appoint Diego Simeone to take over. The Argentine has worked wonders at Atletico Madrid – making La Liga a three horse race and reaching the final of the Champions League on multiple occasions. 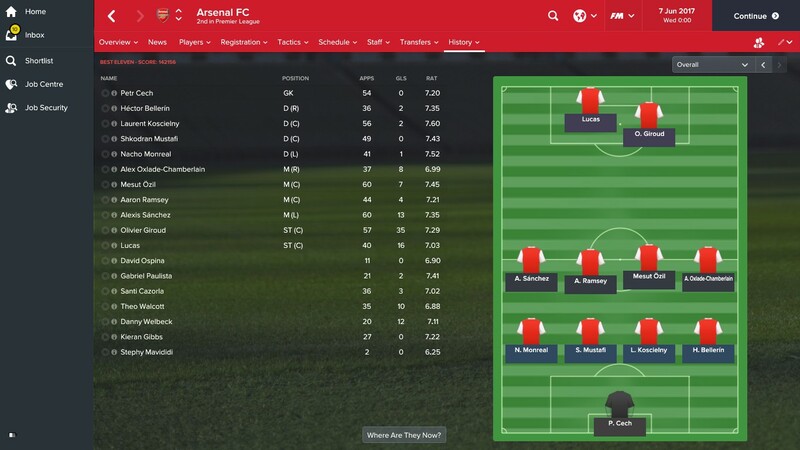 Using the power of Football Manager 17, we replaced Wenger with Simeone to see if the Gunners would improve and mount a serious Premier League title challenge. Despite the financial backing of the Arsenal board, Simeone did not make life easy for himself and chose not spend a single penny in his first summer transfer window at the club. The ex-Atletico defender was clearly happy with his current crop of players and felt no additions was necessary. Only one player left the club – Chuba Akpom joined Wigan on loan. He finally made his first signing in the January transfer window on deadline day. Spanish defender, Nacho Fernandez, found himself surplus to requirements at Real Madrid and completed a £4m move to England. Carl Jenkinson was sold to Southampton, and Yaya Sanogo also departed the club. Simeone went for a traditional 4-4-2 formation after taking the reins at the Emirates. David Ospina was unable to beat Petr Cech to a first-team place in between the sticks despite the ex-Chelsea keeper facing some criticism in recent weeks. Hector Bellerin, Laurent Koscielny, Shkodran Mustafi and Nacho Monreal made up Simeone’s defence; which is a vital part of his philosophy at Atletico Madrid. Alex Oxlade-Chamberlain returned to his favoured right wing position with Mesut Ozil and Aaron Ramsey occupying the central midfield roles. Alexis Sanchez also reverted to his natural position on the left side. Up top, Simeone kept faith in Olivier Giroud and partnered him with Lucas Perez; who has struggled for first-team chances under Wenger despite impressing in his cameo appearances. Arsenal’s defence were the top performers in Simeone’s first season in charge. Koscielny had the highest average rating of 7.60 over 56 appearances. Mustafi and Monreal also impressed as Arsenal conceded the least amount of goals in the Premier League. In midfield, Ozil proved to be a crucial player in a deeper role. He registered 12 assists over the course of the season and helped Arsenal maintain the highest average possession percentage in the Premier League (58%). Ramsey also impressed, his 14 assists was the highest in the league. Thierry Henry once said that Arsenal would never win the league with Giroud up front, but the Frenchman enjoyed a magnificent season. He scored 35 goals in 45 appearances, which made him the top goal scorer in the Premier League and Champions League. It was a season to forget for Francis Coquelin who registered the lowest average rating in the first team, just 6.70. He was restricted to substitute appearances due to the form of Ozil and Ramsey but did not impress when given a chance. Jack Wilshere returned from his loan at Bournemouth, but after making 34 appearances for the Cherries, he found himself instantly transfer-listed as Simeone saw no future for him in North London. The Gunners want £22m for the 25-year-old. Mathieu Debuchy, Rob Holding and Alex Iwobi all struggled for game time and spent the majority of the season in the development squad. Unfortunately for the Gunners, Simeone could not guide them to another Premier League title. Manchester United was dominant under Jose Mourinho and cruised to the top of the league with Arsenal finishing in second; six points clear of third-placed Chelsea. The Gunners away form against the top six sides cost them in the title race. 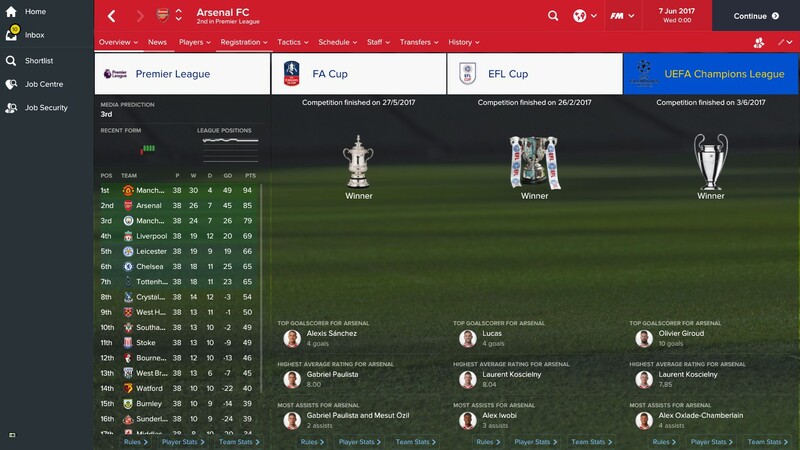 While they fell short in the league, Arsenal were dominant in the domestic cups. Simeone secured his first trophy at the club in February as Arsenal lifted the EFL Cup. They knocked out Birmingham, Reading, Chelsea and Manchester City before beating Aston Villa 3-1 at Wembley. They also won the FA Cup for the 13th time after being handed a relatively run to the final. They defeated Manchester City in extra-time to win the famous trophy. Two trophies was not enough for Simeone who chased glory on the European stage. Arsenal progressed from the group stages in first place with Barcelona finishing in second. They comfortably took out Olympiacos in the first knockout round which set up a quarter-final tie with Atletico. It was the Gunners who progressed on the away goals rule to send Simeone’s former side crashing out. Only Benfica stood in the way of yet another Champions League final for the tactician and Arsenal got the job done in astonishing fashion. A 5-1 win meant they would face PSG in the final. Sanchez and Giroud’s goals helped the Gunners to a 2-0 win over the Parisians giving Arsenal their first ever Champions League crown. 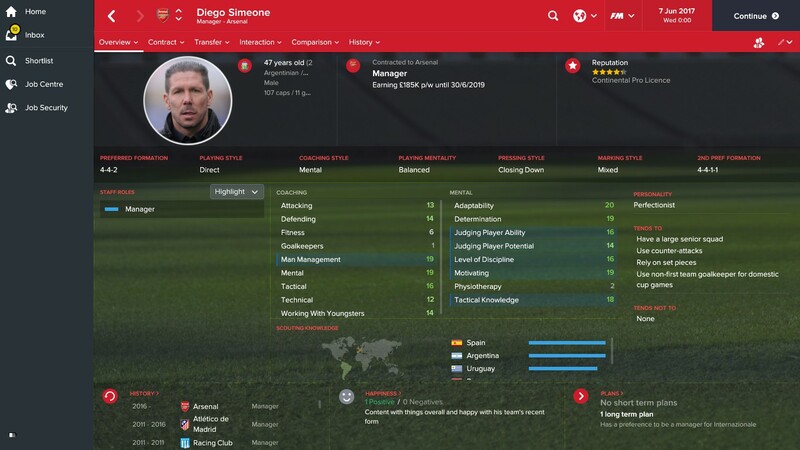 While they did not lift the Premier League, Simeone’s first season at the club was a resounding success. Considering he spent just £4m, delivering three trophies – including the European Cup – is a fantastic achievement. Simeone was able to get the best out of the current Arsenal squad and might have lifted the Premier League trophy if United had enjoyed such an explosive start to the season. 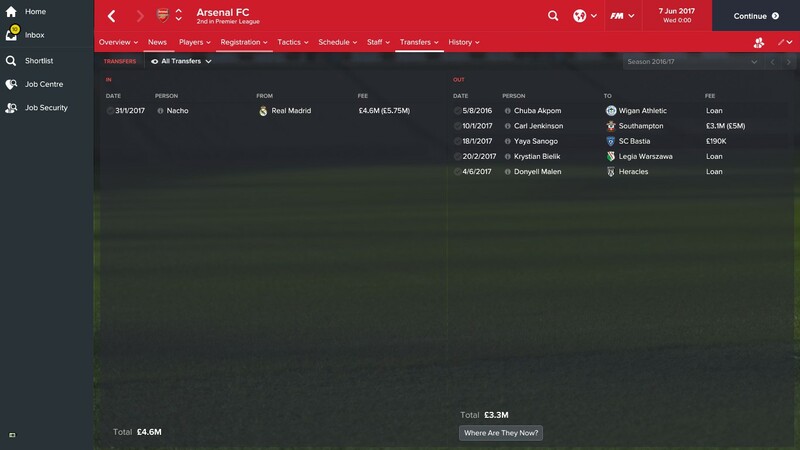 So, according to FM, Arsenal would make the right choice if they did choose to replace Wenger with the Atletico boss. Would the Gunners be able to prise him away from Spain? That is another story. Only time will tell whether Wenger will remain as Arsenal boss, but the pressure is well and truly on with more and more fans starting to turn their back on the legendary manager.